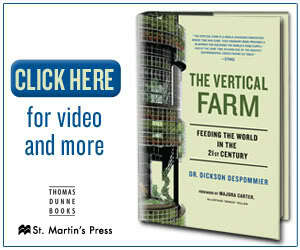 Sting.com > News > The Vertical Farm goes on sale today and is available in bookstores everywhere! The Vertical Farm goes on-sale today and is available in bookstores everywhere! Visit www.VerticalFarm.com to learn more about Dickson Despommier and this revolutionary idea that addresses global concerns about water scarcity and pollution, carbon emission, crop failure, and lack of arable land. Sting, world-renowned musician and co-founder of the Rainforest Fund, along with his manager and producing partner Kathryn Schenker, have acquired the film rights to the book The Vertical Farm by Dr. Dickson Despommier, which will be published in October 2010 by Thomas Dunne Books/St. Martin's Press. The vertical farm, in which food is grown inside tall city buildings, would transform the way we grow food, clean our water and create new energy. Vertical farms, which have excited scientists, architects, and politicians around the globe, will be the centerpieces of the self-reliant cities of the future. Dr. Dickson Despommier spent over thirty years as a professor of public health and environmental health sciences at Columbia, where he has won the Teacher of the Year Award eight times. His work on vertical farms, www.verticalfarm.com/, has been featured on such top national media as CNN, "The Colbert Report," and "The Tonight Show," as well as in full-length articles in The New York Times, Time Magazine, Scientific American, and The Washington Post. He recently spoke at the TED Conference, PopTech and the World Science Festival, and has been invited by the governments of India, Mexico, Jordan, Brazil, and Korea to work on environmental problems. He has spoken to audiences at many universities, including Harvard and MIT. The producers plan a feature-length documentary based on the first vertical farm to be built in a major city in the USA. The deal was brokered by Joel Gotler of IPG in Los Angeles on behalf of NYC literary agent and book producer Mel Parker of Mel Parker Books, LLC. We are pleased to announce that Sting will extend his celebrated 'Symphonicity' world tour to Japan in January 2011 with dates in Osaka, Nagoya and Tokyo. Sting has been touring the world with his 78-stop 'Symphonicity' tour. His show at the Edinburgh Playhouse in Scotland was the 61st performance and the crowd were blown away.